The new GI Bill should be presented with a big check like you just won the lottery. A newscaster should ask you what you’re going to do now that you have the GI Bill. It’s really that good. Back in the day, getting a military scholarship to pay for tuition and books was a major feat. For mine, I filled out mountains of paperwork. I met with my commander to ask for an endorsement. I committed to attend ROTC. 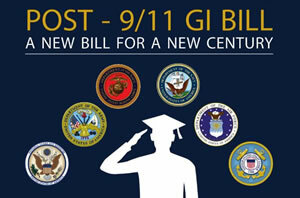 The new GI Bill gives you a full scholarship and more without the hassle. All this for 3 years! A quick look on the UC Davis Community Housing Listing shows that a two-bedroom apartment is around $1,000. So the monthly living allowance could more than pay for your housing. Get a part-time job on campus and you’re set! Today’s military are extremely fortunate to have this program available. A wise plan would be to accomplish the first year of college while in the military using tuition assistance. When you go to college full-time, you’ll have a full ride for the remaining three years.